The extraordinary claim of “chevron” genesis by mega-tsunamis cannot withstand simple but rigorous testing. I am far from being a tsunami expert, but I find this subject fascinating. The issue of suspended load vs. bedload and stratified or laminated vs. graded bedding is equally important for deposition from tsunami waves and turbidity currents. It is worth spending a bit of time and blogspace to explore the kind of analysis of sediment transport conditions that this paper presents. 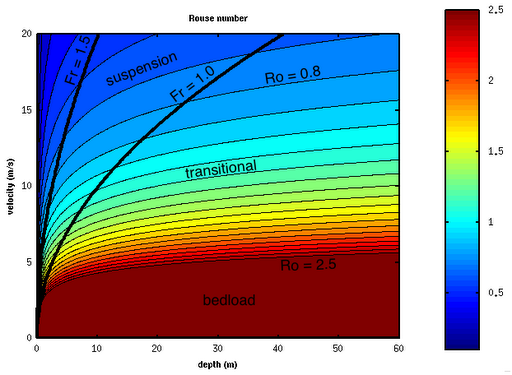 Although I see no reasons to disagree with the paper’s conclusions (as it could be predicted from my previous posts on the subject), at first reading I didn’t fully understand the line of reasoning about suspended load vs. bedload. So here goes my attempt to understand it. The argument goes as follows. The Rouse number is the ratio between the settling velocity of a certain grain size and the shear velocity of the flow, multiplied by von Karman’s constant (which is ~0.4): Ro = ws/k*u_shear. For a grain of a given size, if the Rouse number is larger than 2.5, the grain’s settling velocity is much larger than the upward-directed component of the turbulence, and the grain tends to stay close to the bottom, in the bedload. [This is equivalent to saying that the settling velocity has to be larger or equal to the shear velocity, a condition also known as the suspension criterion]. If the Rouse number is less than 0.8, the flow is turbulent enough to keep the grain fully suspended. In between these values, there is a zone of transitional behavior. For the flows that might have deposited the chevrons, the Rouse number is always less than 2.5, regardless of how the other parameters like the Froude number, grain diameter, and roughness length are varied. Although the authors state that the flows must have been deeper than 8 m (because most chevrons are higher than 4 m, and the flow must be at least twice as high as the bedform), there seems to be no other constraint on tsunami behavior [note that I did not have access – yet – to the supplementary web material]. So the question is: doesn’t this reasoning apply to other types of flows as well? For example, the Mississippi River is certainly deeper than 8 m in many places — does this mean that it is able to suspend very coarse (2 mm diameter) sand? In other words, what is the difference between flow in a tsunami run-up and the Mississippi River? The answers might be obvious to many, but they are certainly not obvious to me. The Rouse numbers shown in this plot are valid for a grain diameter of 2 mm and roughness length of 1 m (using the same equations for settling velocity and shear velocity as in Bourgeois & Weiss 2009). Anything coarser than this cannot be called sand any more. So if this grain size doesn’t stay in the bedload, there is no chance for finer sediment either. It is obvious from the plot that, for flows deeper than 8-10 m, very coarse sand will be part of the bedload unless flow velocity is larger than ~5 m/s. The Mississippi River at New Orleans has velocities on the scale 1.5 m/s, so 1-2 mm sand should definitely stay close to the bottom, and in fact it does. If we assume that the tsunami run-up has a comparable velocity to that of the tsunami wave in the nearshore zone, we find that the Froude number of the run-up must be around 1. This is obviously a very back-of-the-envelope argument, but the point is that these flows must have in general relatively large Froude numbers. If we plot the lines for Fr = 1 and Fr =1.5 on the depth-velocity diagram (see above), we can see how different likely tsunami behavior is from that of large rivers. It also becomes evident that even coarse sand would not be part of the bedload in these flows, especially not in flows deep enough to build the ‘chevrons’. Which means that sandy tsunami deposits are likely to be largely unstructured or poorly structured sand sheets rather than several m thick accumulations of cross-bedded sand. And that ends my Saturday exercise in Fluid Mechanics 101. I need to study this post in more detail later … but before I forget to as, did you make that plot above? Yes, it’s the first plot I made with Octave on a Mac :). Any thoughts on how your plot compares with the flows that created the Channeled Scablands? Most think that those flows did indeed create large-scale bedforms (scaled to the flow) … I don't remember offhand, but those flows must've been >20 m/sec or so (?) and exceptionally deep. Robert Weiss here. You paraphrase very well. Please let me know if you have any other question regarding our research. According to the sidebar at The Accretionary Wedge, you have participated in this geology carnival in the past. We have a new edition going up soon, around the theme of "When and where would you most like to visit in person to witness something first-hand?" Are you going to be able to join our time warp? (more details at the link) We're trying to get The AW back on it's feet, and would love to have you participate. Sorry for the short notice, but late submissions will be added on as they arrive.